This is a sponsored post written by me on behalf of Sara Lee® Artesano™ Bread, but my love for this bread is 100% my own. 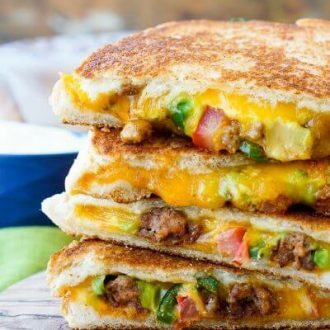 This Taco Grilled Cheese Sandwich can be customized just like a taco! The original recipe is packed with bold flavor and a little heat for a lunch or dinner that’s sure to leave your mouth watering! 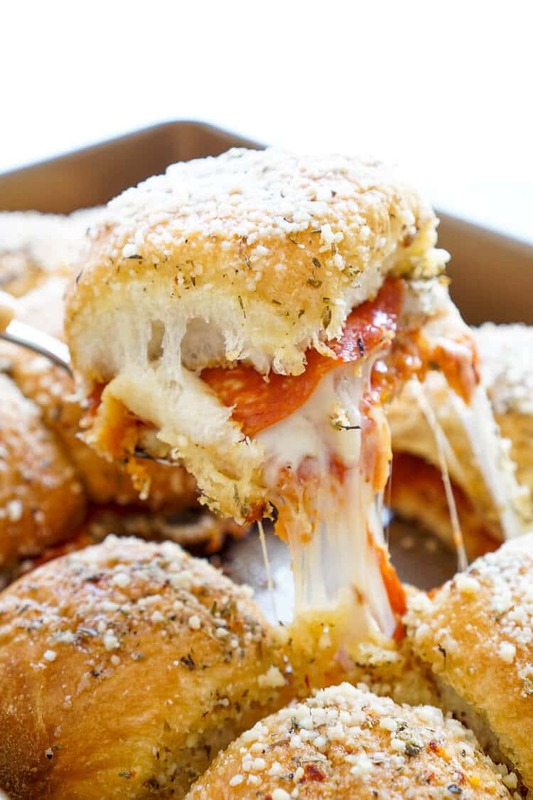 PIN IT TO YOUR LUNCH OR DINNER BOARD AND FOLLOW SUGAR & SOUL ON PINTEREST FOR MORE RECIPES! Grilled cheese sandwiches were a staple of my youth. Most days after school, my Nana made us either grilled cheese sandwiches or peanut butter cracker sandwiches, we could always count on one or the other. 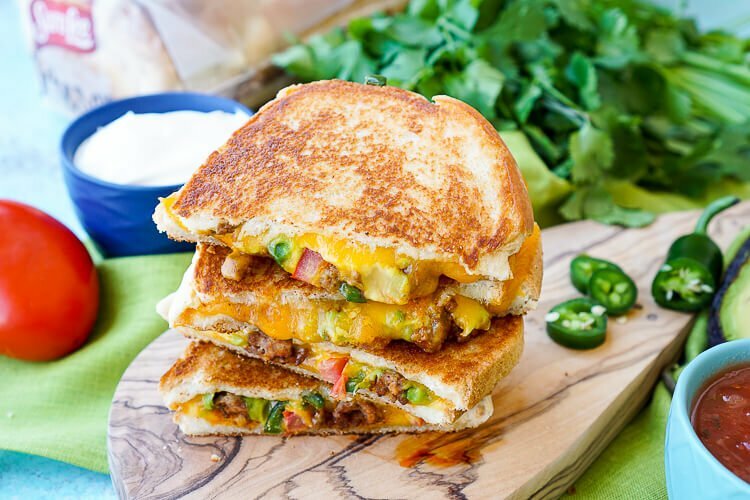 But now that I’m all grown up, I like to get a little more creative with my grilled cheese sandwiches and since April is National Grilled Cheese Month, I figured it was a good time to share one of these mouthwatering recipes with you! Now, it’s just the two of us. 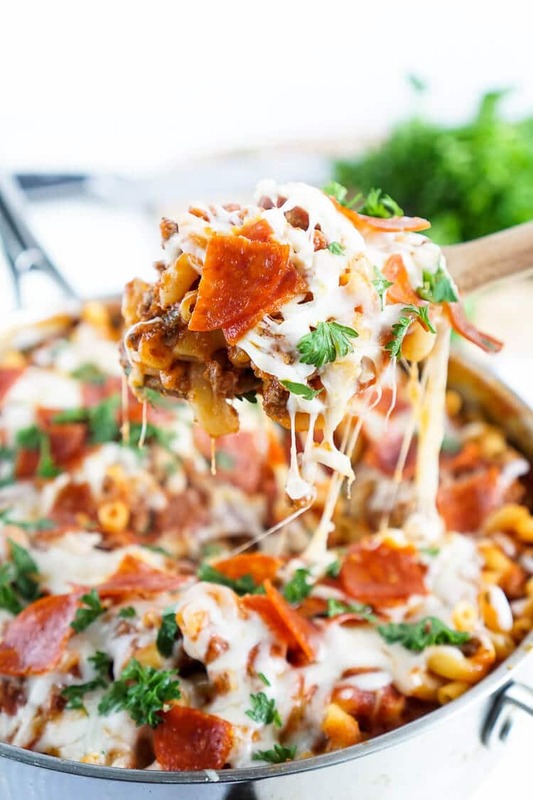 And it seems like most meals are designed for a family of four, heck, even a lot of my dinner recipes are made for larger families, that’s why I always make sure to make things that reheat well. Tacos are a weekly staple in our house as I’m sure they are in many of yours, but if it’s just the two of you, what do you do with all that extra food? You make Taco Grilled Cheese Sandwiches of course! 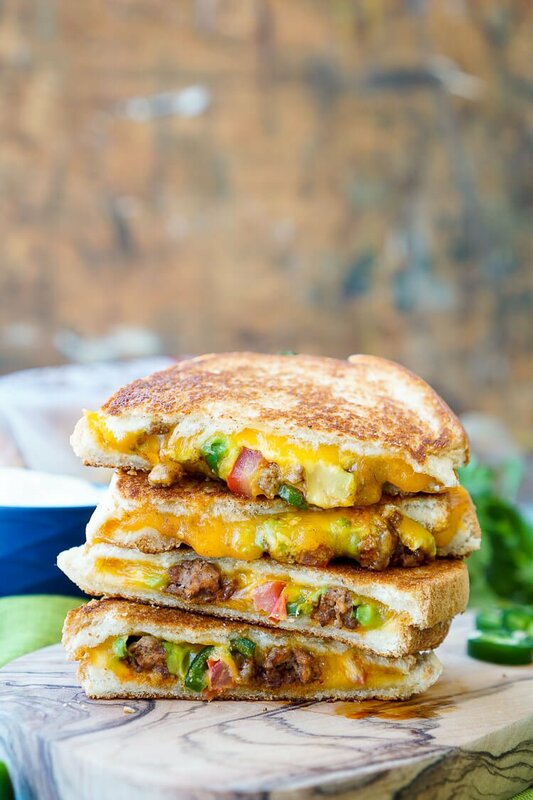 These Taco Grilled Cheese Sandwiches are a great way to use up extra taco meat and toppings and the cheddar cheese and Sara Lee® Artesano™ Bread gives them a whole new feel so you don’t feel like you’re eating tacos “again”. The Artesano™ Bread takes the ordinary to extraordinary is about as close to homemade bread as I’ve found in stores, and the thick slices and soft texture are perfect for holding together a sandwich that’s loaded up like this one! 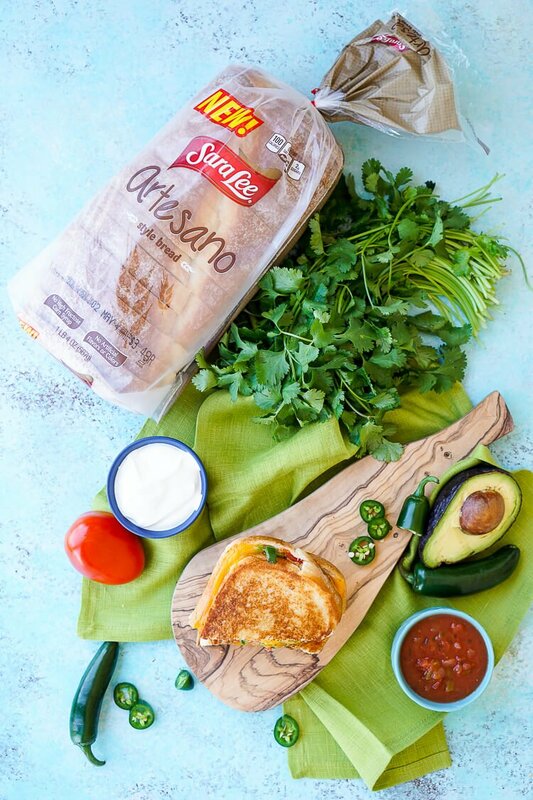 The Artesano™ Bread is made without artificial colors, flavors, and without high-fructose corn syrup, making it a bread choice you can feel good about! One of the things I love most about tacos is that they’re so customizable and everyone can make them their own! 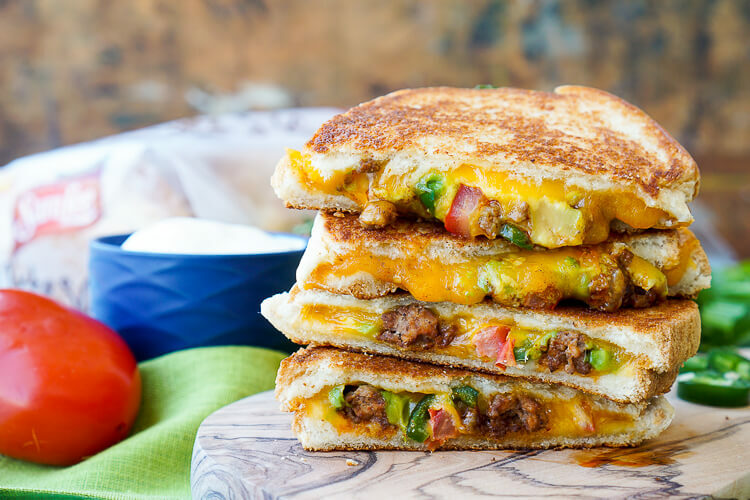 This Taco Grilled Cheese Sandwich is the same way, you can add and leave out what you want. However, I would refrain from adding things like sour cream and salsa directly to the sandwich because it could get messy, rather serve them on the side so you can dip each bite of your sandwich in them! 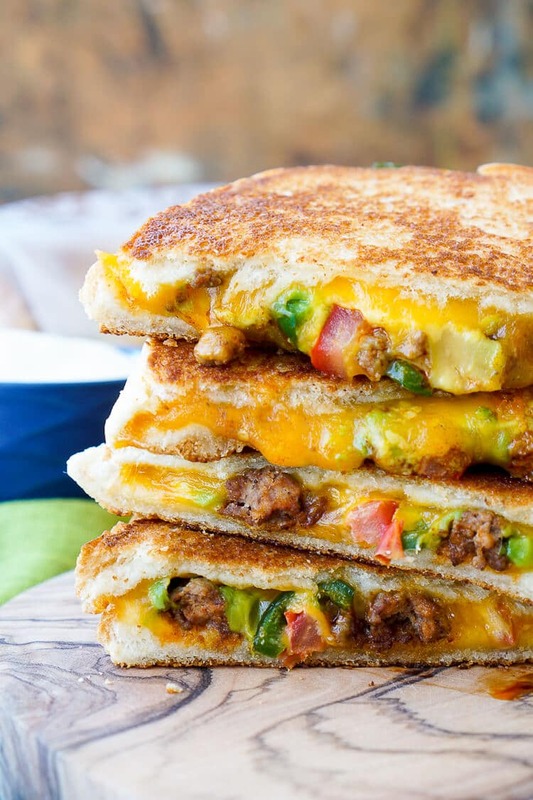 Ready to make a Taco Grilled Cheese Sandwich of your own? 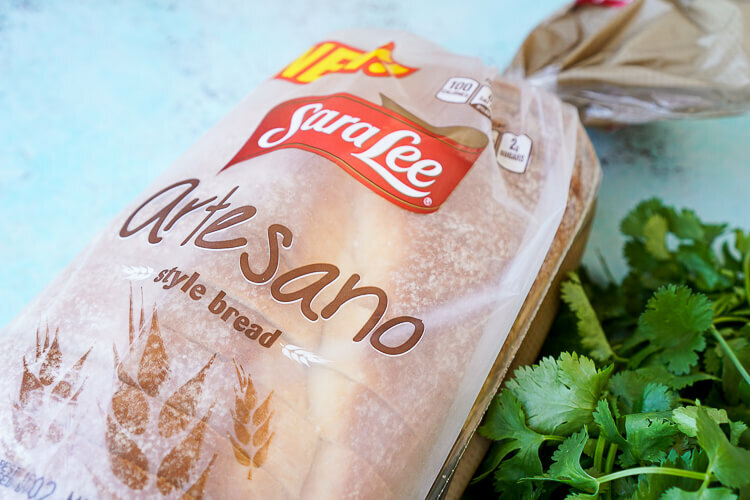 The Sara Lee Artesano™ Bread can be found in the grocery bread aisle and has an average price of $2.99, making it the perfect solution for consumers who want the taste and heartiness of bakery bread, but the convenience and cost of a pre-packaged loaf. It can also be found at Walmart on Rollback until 7/13/2016. 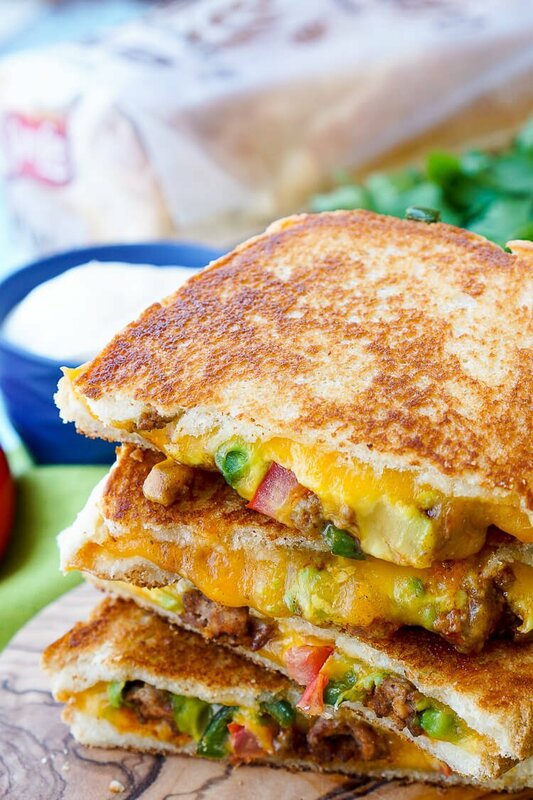 This Taco Grilled Cheese Sandwich can be customized just like a taco! The original recipe is packed with bold flavor and a little heat for a lunch or dinner that's sure to leave your mouth watering! 1/2 lb ground beef seasoned for tacos, we always use leftovers. Butter one side of a piece of bread with the softened butter and place butter-side down in a medium non-stick skillet over medium heat. Add a slice of cheese to the bread and spoon 1/4 of the beef, 1/4 of the diced tomatoes, and 1/4 of the diced peppers on the cheese. Lay 1/4 of the avocado slices over the top and top them with another slice of cheese. Butter one side of another slice of bread and place it butter-side up on top of the cheese, cook until cheese begins to melt and bread turns a golden brown, flip and cook the other side until cheese is melted through. Repeat for other sandwiches. You really are a girl after my own heart! 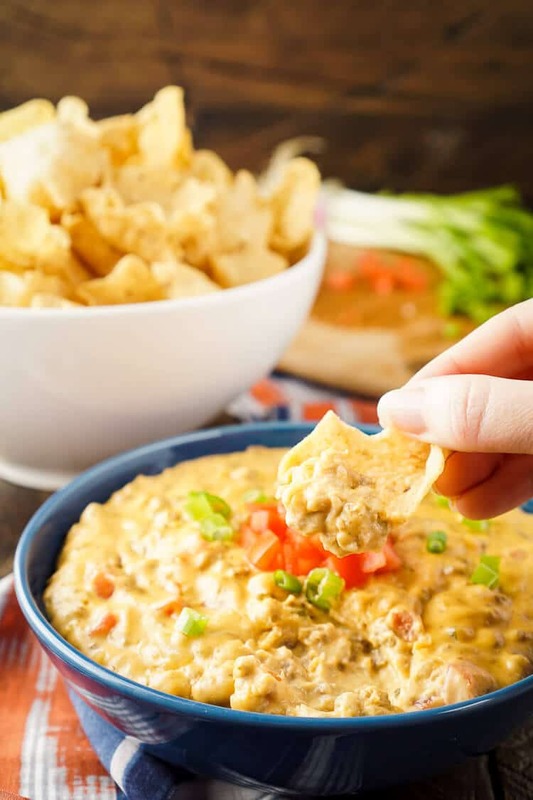 Cheese and jalapenos are pretty much my favorite things on the planet… add in some taco meat and grill to melty perfection… umm, YES please!! (Not to mention this is a great way to stretch out the meat when there’s not a ton leftover)! Yes, this is such a great use for leftover meat, each sandwich doesn’t need much to pack a ton of flavor! And yeah, cheese and jalapenos… you just can’t go wrong! I am SO glad I saw this on Twitter today! I love this bread already and we were going to have ‘tacos again’. THIS is supper tonight!! Oh yay! No need to eat “tacos again”, time for something new and exciting! This looks delicious! I love everything about this sandwich.